Case material: White gold; Charge: Automatic; Conditions: Used Presentation condition : Without documents; Place: Usa, Boca Raton Model: Tank Francaise Price on request Jewels in Time Reference: 2366 Pristine preowned Large Cartier Tank Francaise automatic in solid 18k white gold and diamond(original factory diamond bezel and crown). Date at 6:00. Comes with its box and papers. Total weight: 146 grams/94 dwt. Case material: Steel; Charge: Quartz; Conditions: Used Presentation condition : Without documents; Place: Usa, New York Model: Tank Francaise $ 2625 Element iN Time Reference: W51011Q3 This Mid-Size Tank Francaise Is In Immaculate Condition For A Second-Hand Watch. 25mm Stainless Steel Case With A Solid Case Back. Cartier Stainless Steel Bracelet, Which Fits A 6.75 Inch Wrist Perfectly. 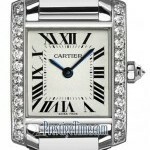 Cartier Stainless Steel Double-Folding Clasp. Silver Roman Dial With Blued-Steel Hands. 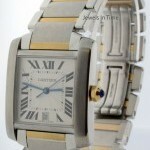 Cartier Caliber 175 A Quartz Movement. Date Aperture Is Located At The Three O'Clock Position. 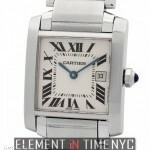 A Full One Year Warranty And Certificate Of Authenticity Will Be Issued By Element iN Time NYC. 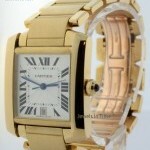 Case material: Yellow gold; Charge: Automatic; Conditions: Used Presentation condition : Without documents; Place: Usa, Boca Raton Model: Tank Francaise Price on request Jewels in Time Reference: 1840 Pristine preowned large size Cartier Tank Francaise in solid 18k yellow gold on bracelet features an automatic movement. Comes with its box and book as shown. Case material: Steel; Charge: Automatic; Conditions: Used Presentation condition : With boxes and all papers; Place: Usa, Boca Raton Model: Tank Francaise Price on request Jewels in Time Reference: 2302 Pristine preowned Cartier Tank Francaise Automatic in steel and 18k yellow gold features a guilloche dial with date at 6:00. Case material: Steel; Charge: Quartz; Conditions: Used Presentation condition : Without documents; Place: Usa, New York Model: Tank Francaise $ 3329 Element iN Time Reference: W51001Q3 This Tank Francaise Chronograph Is iN Immaculate Condition With No Signs Of Wear And Tear. 28mm Stainless Steel Case With A Solid Case Back. 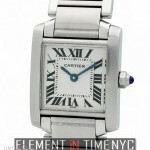 This Watch Has The Traditional Cartier Silver Dial With Black Roman Numeral Hour Markers And Blued-Steel Hands. 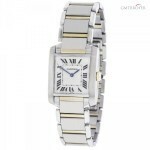 Cartier Stainless Steel Bracelet, Fits Up To A 7.5 Inch Wrist Comfortably. 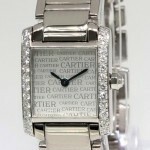 Cartier Stainless Steel Butterfly Clasp. This Watch Features A Three Register Chronograph As Well As A Date Sub-Dial. A Full One Year Warranty And Certificate Of Authenticity Will Be Issued By Element iN Time NYC. Case material: Steel; Charge: Quartz; Conditions: Used Presentation condition : Without documents; Place: Usa, New York Model: Tank Francaise $ 2725 Element iN Time Reference: W51008Q3 This Watch Is iN Immaculate Condition With No Signs Of Wear And Tear. 20mm Stainless Steel Case With A Solid Case Back. Silver Dial With Black Roman Numerals And Blued-Steel Hands. 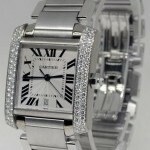 Cartier Stainless Steel Bracelet. 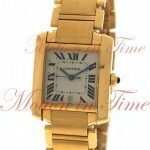 Cartier Caliber 057 Quartz Movement. Water Resistant To 30 Meters. 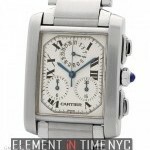 A Full One Year Warranty And Certificate Of Authenticity Will Be Issued By Element iN Time NYC. Case material: White gold; Charge: Quartz; Conditions: Used Presentation condition : Without documents; Place: Usa, Boca Raton Model: Tank Francaise Price on request Jewels in Time Reference: 2403 Near mint preowned ladies Cartier Tank Francaise in 18k white gold features Cartier Anniversary silver dial and Cartier factory diamond bezel. Comes with box and papers (open) as shown.